The moment a client enters your establishment, before they even encounter your products and services, they’re making judgments about whether or not they’ll want to come back or recommend you. These opinions are based on a variety of preconceived notions, but two primary things they’ll notice are your company’s cleanliness and its branding. That’s why, while wowing your customers with your products and services is important, just as crucial is the appearance of your business. Custom floor mats for business spaces are an excellent, easy solution to client first impressions because they help prevent the spread of dirt on your floors, help prevent slip-and-fall accidents and help your business make a better first impression. 1. Custom floor mats should enhance your company branding and image. Whether you want to print your company logo, or another customizable design onto your mats, they serve as a great space to show clients what it’s like to work with your business. Just as with designing your company logo, the colors you use combined with any words or phrases you select can quickly give an individual an impression of what your business cares about. And while custom floor mats for business spaces are great because of the fact that you can customize the design to suit your brand, they also improve your branding because you want customers to think you are a safe, quality provider of the goods or services you sell. A clean work environment shows clients that you care about their health and safety and that you have an eye for detail. By trapping dirt and preventing it from spreading onto your floors, you create a cleaner space, which influences how a potential client will look at your brand. 2. Custom floor mats should specifically suit your needs. Custom floor mats for business spaces don’t just stop at the image the mat displays. The term also refers to the actual shape and size of the mat. Every business is different, and so is the space they conduct business in. Therefore, there’s no one-size-meets-all mat. With a custom floor mat, you can find an option that will not only fit in your entryway, but look great, like it was built just for you. 3. 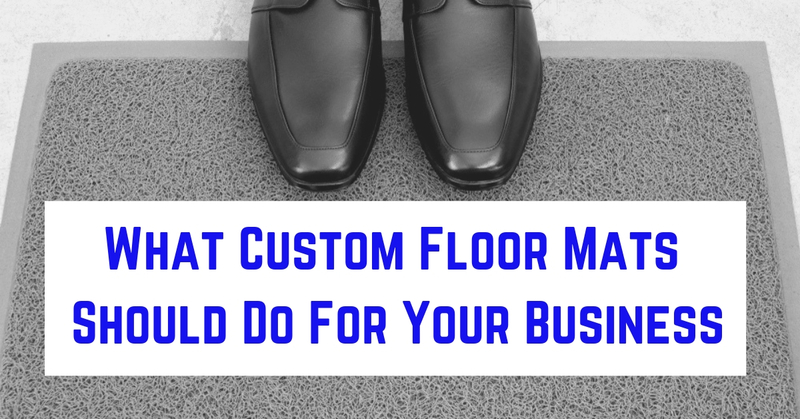 Custom floor mats for business spaces should help prevent slip-and-fall accidents. If a customer gets hurt on your premises, it’s likely they’re not going to be coming back anytime soon, unless it’s to collect money for the injury and trauma. And if you think your business is immune to this potential threat, think again. According to the CPSC, approximately 2.7 million people per year are injured from landings, ramps, stairs and floors. A quality floor mat shouldn’t just look good and prevent the accumulation of dirt. It should also provide a level of traction that prevents customers from slipping as they change from walking on one surface to another. At NDC Mats, we understand that your business has multiple needs, which is why we’ve selected top-quality custom floor mats for business spaces that are slip-resistant, aesthetically pleasing, and customizable from the logo to the size so you get exactly what you’re looking for. To learn more about our custom floor mats for businesses, contact us today at 800-238-2387 and receive your free quote!